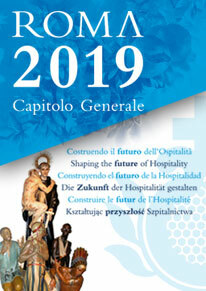 The new General Manager of the Fatebenefratelli Hospital of Saint John Calibita on Tiber Island is Stefano Michelini. He was officially introduced to all the hospital staff today, 3 July, by the Chief Operating Officer of the Hospital, Brother Pascal Ahodegnon. Stefano Michelini is a manager who has given proof of his professionalism, competence and experience over several years of working in medicine and hospitals, and has always worked in highly competitive, innovative and humanising institutions, such as the Centro Cardiologico Monzino in Milan, the European Institute of Oncology, and most recently the Policlinico Agostino Gemelli in Rome. The new General Manager replied by saying, “The reason I was encouraged to take on this great responsibility is that in the Brothers of Saint John, I have found the values which I have always pursued wherever I have worked. But it should not be taken for granted that health care services will always provide holistic care for their patients. And so it is with a great sense of responsibility and pride that I have accepted to take on this challenge. Over the coming days, the General Manager will be visiting the different sectors of the Hospital to become thoroughly and more directly acquainted with the complex reality which is Tiber Island Hospital.